Lavenders of all varieties are one of the most popular herbs grown today. Provence lavender is one of the larger varieties, making it a good choice for garden borders and walkway hedges. In general, lavenders, including Provence, are not difficult to grow or maintain and make a fragrant and colorful addition to any garden. Lavender prefers full sun and well draining soil. Lavender does not need a great deal of organic matter in the soil to grow, but if your soil has poor drainage be certain to amend with compost prior to planting. Plant in a hole twice the size of the root ball. Lavenders can be planted in the spring, after all danger of frost has passed, or in the early fall. For the best arrangement, plant in groupings of odd numbers. Three or five lavender shrubs planted along a border make a colorful and fragrant arrangement. Provence lavender is one of the taller lavender varieties, growing two to three feet tall with a spread of up to three feet. When selecting a site for your plant, be certain it will have enough room to mature without encroaching on other nearby plantings. Provence lavender has gray-green leaves, purple flowers and a woody-shrub habit. Provence lavender is drought tolerant. It does best when watered deeply but infrequently. Once a week, after the plant has become established, should be sufficient. It is important that the soil be well draining. Amend the soil with mulch or compost if necessary to encourage proper drainage. Lavenders of all varieties are susceptible to root rot if they are left in standing water. Harvest lavender just as it begins to bloom for best color and fragrance after it has dried. Cut flowers with as much stem as possible. Harvesting in the morning will capture more of the fragrant oils. To dry, bunch stems together with rubber bands and hang in a cool, dry place. Remember that the stems will shrink as they dry, so be certain to band them as tight as possible to prevent your drying bunches from coming undone. Lavender produces flowers on new growth, so pruning lavender is advised to encourage the most flower production from year to year. 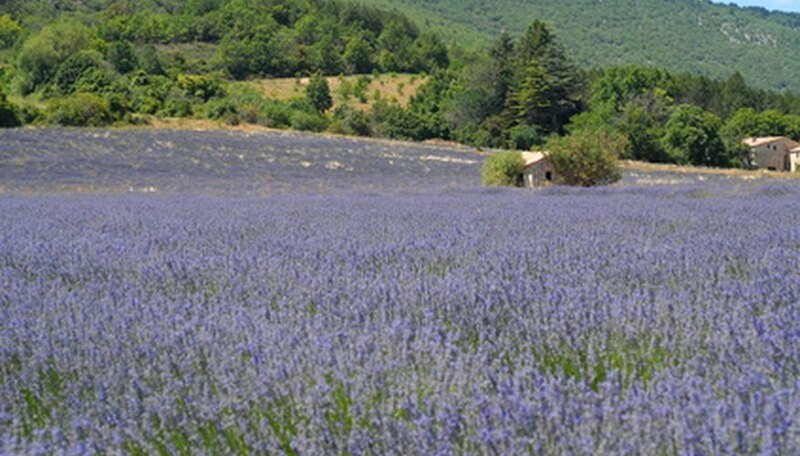 Provence lavender, due to its larger growing habit, needs to be pruned by a third of its size each year, starting the year after it is first planted. Prune in the spring when new green leaves appear. While pruning, shape the plant to your preference. Lavenders are not plagued by many diseases or pests. They are prone to root rot if not grown in well-draining soil. They can also suffer in extreme cold if there is no protection provided by snow cover in the winter or heavy mulch laid down in the fall. Kemper Center for Home Gardening: Lavandula x intermedia "Provence"